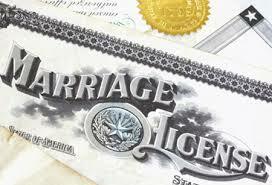 To be married in Washington State, you need a valid Washington State marriage license. Whether you are being married in three days, next week or next month, here are easy steps to obtain, secure and use your valid marriage license from Seattle. To do this, you and your partner will visit a Marriage Licensing office in Seattle/King County during regular business hours. The cost for the license is $64, cash or debit/credit card. No blood test is required and both of you must at least 18 years of age. When you leave the government office, you’ll walk away with a packet of legal paperwork which you will give to your Officiant or Minister on your wedding day. The person who marries you must review this paperwork before your ceremony takes place and he or she will then get required signatures (both of yours and two witnesses) and return your signed legal document back to the County for processing/certification. Note: There is a 3-day waiting period from the date your marriage license is issued. What this means is that from the date your license is issued, you must wait 3 full days before you can be legally married. Also, most people who reside in the Seattle area secure their marriage license in Seattle. If by chance you are being married in any other County in Washington State, the license you secure in Seattle/King County is valid in all Counties in Washington State. All particulars are on this website (including office locations) and while most couples do apply for a license in person, you may initiate the process via phone and regular mail. Once you have your valid license in hand and have exhausted the three-day waiting period, you can get married!